With the exception of Kung Fu Panda, there hasn't been much to enjoy about the more family friendly work of Jack Black lately. Therefore we're hopeful but skeptical about him starring in Goosebumps, a film inspired by the R.L. Stine horror book series for kids of the same name from the actor's Gulliver's Travels director Rob Letterman. However, the meta storyline sees Black playing Stine himself, a monster whisperer of sorts who uses his books to keep these terrors locked up. Now we have two first look photos from the film featuring Black with Dylan Minnette (Prisoners) and Odeya Rush (We Are What We Are). In his new neighborhood, teen Zach Cooper (Dylan Minnette) meets the beautiful girl next door, Hannah (Odeya Rush). But then Zach learns Hannah's father is R.L. 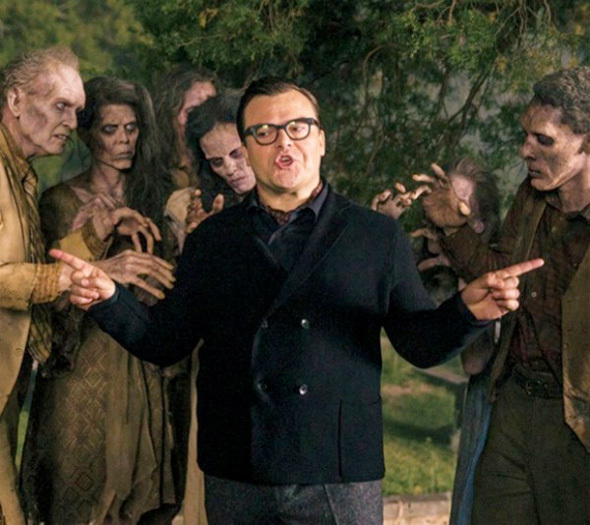 Stine (Jack Black), the author of the bestselling Goosebumps series. It turns out that there is a reason why Stine is so strange: he is a prisoner of his own imagination. The monsters in his books are real, and Stine protects his readers by keeping them locked up in their books. When Zach unintentionally unleashes the monsters from their manuscripts and they begin to terrorize the town, it’s up t them to get the monsters back in the books where they belong. Rob Letterman (Gulliver's Travels) directs the film which Columbia Pictures releases next summer on August 7th, 2015. Read most of these books as a kid. Always wanted to see them brought to life. This actualy seems like a really cool way to do that. Woah I am excited to see this. It looks like Jack Black is having a ball. Wow that director and Jack Black again?? I'm gonna avoid this nightmare like the plague. lol - I know no one who would want to be portrayed by Jack Black. Nothing wrong with that at all... just sayin'. Interesting choice.